Data is definitely priceless. But it is not a cake walk to analyze it as greater things come at a greater cost. With the exponential growth in data, there requires a process to extract meaningful information as conclude to useful insights. Data mining is the process where the discovery of patterns among large sets of data to transform it into effective information is performed. This technique utilizes specific algorithms, statistical analysis, artificial intelligence and database systems to juice out the information from huge datasets and convert them into an understandable form. 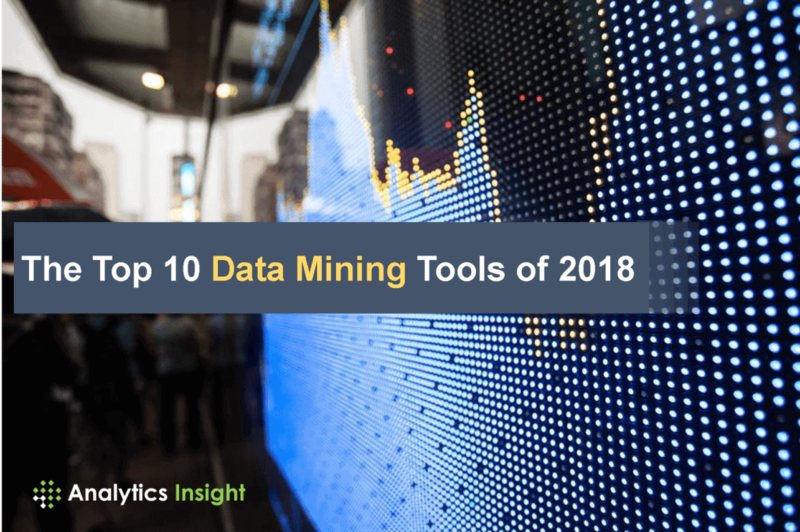 This article lists out 10 comprehensive data mining tools widely used in the big data industry. Rapid Miner is a data science software platform that provides an integrated environment for data preparation, machine learning, deep learning, text mining and predictive analysis. It is one of the apex leading open source system for data mining. The program is written entirely in Java programming language. The program provides an option to try around with a huge number of arbitrarily nestable operators which are detailed in XML files and are made with graphical user interference of rapid miner. It is a representative of the Oracle’s Advanced Analytics Database. Market leading companies use it to maximize the potential of their data to make accurate predictions. The system works with a powerful data algorithm to target best customers. Also, it identifies both anomalies and cross-selling opportunities and enables users to apply a different predictive model based on their need. Further, it customizes customer profiles in the desired way. When it comes to large-scale projects IBM SPSS Modeler turns out to be the best fit. In this modeler, text analytics and its state-of-the-art visual interface prove to be extremely valuable. It helps to generate data mining algorithms with minimal or no programming. It can be widely used in anomaly detection, Bayesian networks, CARMA, Cox regression and basic neural networks that use multilayer perceptron with back-propagation learning. Konstanz Information Miner is an open source data analysis platform. In this, you can deploy, scale and familiarize data within less than no time. In the business intelligent world, KNIME is known as the platform that helps to make predictive intelligence accessible to inexperienced users. Moreover, the data-driven innovation system helps uncover data potential. Also, it includes more than thousands of modules and ready-to-use examples and an array of integrated tools and algorithms. Available as a free and open source language, Python is most often compared to R for ease of use. Unlike R, Python’s learning curve tends to be so short that it becomes easy to use. Many users find that they can start building datasets and doing extremely complex affinity analysis in minutes. The most common business-use case-data visualizations are straightforward as long as you are comfortable with basic programming concepts like variables, data types, functions, conditionals and loops. Orange is an open source data visualization, machine learning and data mining toolkit. It features a visual programming front-end for exploratory data analysis and interactive data visualization. Orange is a component-based visual programming software package for data visualization, machine learning, data mining and data analysis. Orange components are called widgets and they range from simple data visualization, subset selection and pre-processing, to evaluation of learning algorithms and predictive modeling. Visual programming in orange is performed through an interface in which workflows are created by linking predefined or user-designed widgets, while advanced users can use Orange as a Python library for data manipulation and widget alteration. Kaggle is the world’s largest community of data scientist and machine learners. Kaggle kick-started by offering machine learning competitions but now extended towards public cloud-based data science platform. Kaggle is a platform that helps to solve difficult problems, recruit strong teams and accentuate the power of data science. Rattle GUI is an open and free software package providing a graphical user interface for data mining using R statistical programming language provided by Togaware. Rattle provides considerable data mining functionality by exposing the power of the R through a graphical user interface. Rattle is also used as a teaching facility to learn the R. There is an option called as Log Code tab, which replicates the R code for any activity undertaken in the GUI, which can be copied and pasted. Rattle can be used for statistical analysis, or model generation. Rattle allows for the dataset to be partitioned into training, validation and testing. The dataset can be viewed and edited. Waikato Environment for Knowledge Analysis (Weka) is a suite of machine learning software developed at the University of Waikato, New Zealand. The program is written in Java. It contains a collection of visualization tools and algorithms for data analysis and predictive modeling coupled with graphical user interface. Weka supports several standard data mining tasks, more specifically, data pre-processing, clustering, classification, regression, visualization, and feature selection. Teradata analytical platform delivers the best functions and leading engines to enable users to leverage their choice of tools and languages at scale, across different data types. This is done by embedding the analytics close to data, eliminating the need to move data and allowing the users to run their analytics against larger datasets with higher speed and accuracy.